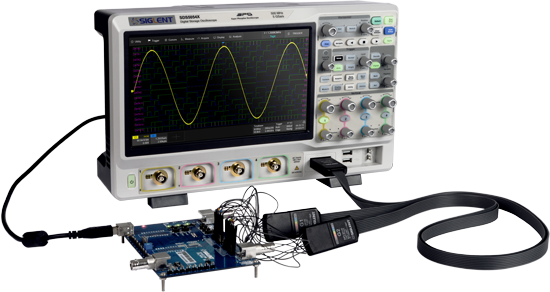 Siglent Technologies has introduced their flagship oscilloscope SDS5000X. It is available with bandwidths of 350, 500, and 1 GHz, and features a maximum sample rate of 5 GS/s. The oscilloscope features a substantial 250 Mbit/s of acquisition memory and a waveform-update rate of up‑to 110 000 wfm/s. To help maintain high test speeds, many of its waveform analysis features are implemented in hardware. For serial bus troubleshooting, the SDS5X includes free decoding on all low speed serial buses such as CAN, LIN, EIA-232, and I2C. It can be upgraded with decoding kits for more specialized buses including CAN FD, at any time. The scope also features bandwidth upgrade options. The product includes a full digital trigger with qualified and zone triggering to help isolate faults. This technique enables a sensitive and accurate trigger control. It also includes a low noise front end that delivers a vertical sensitivity of 500 µV/div, making the product, a tool for debugging small signals. The scope includes a responsive 10,1‑inch touch screen that includes gesture operation and a clear layout. For example, setting up the zone trigger is as simple as drawing a target around the waveform with the fingers. For multi-domain analysis, the oscilloscope has hardware-based frequency analysis utilizing up-to 2 Mbit/s for the FFT‑calculation. This deep memory FFT provides higher frequency resolution than many other FFT based systems, said the company. Furthermore, the device can be upgraded to include MSO/16 digital channels and an external 25 MHz arbitrary waveform generator at any time.